We published the first part of the Hitchhiker's Guide To Neos Fusion last week. It would be great to put all that knowledge to a test-drive, wouldn't it? Before diving into Neos and starting to build your next awesome project, take a break and solve these exercises to sharpen your Fusion skills. If you haven't done so before, have a look at the Hitchhiker's Guide Part 1 before trying to solve these exercises. If you are brave, just go ahead and try your luck. Let's start by generating output with a simple value declaration. That's a string, number or boolean literal. You'll get some prepared Fusion code that you need to modify to solve the exercises. Just press the "Run" button and inspect the output. Messages will give you a hint if something was wrong. If the button is green, you have correctly solved the exercise! Let's go ahead and build something more sophisticated. An object can express much more and is the main building block in Fusion. Let's see how to use objects for different purposes. We start with the Array object that will render all individual properties and evaluates to the combined output. Did you notice the Array and string values in Fusion take whitespace literally? Object declarations can be extended at any time - that's a true advantage of using a declarative style for the view. For this case a property can be declared or overridden by using the path syntax output.hello = 'Hello'. Extend the existing object declaration to produce the output Hello world! Objects are already much more powerful than simple values. But the real flexibility in Fusion comes from the built-in expression engine that is called Eel. They can be used for every property, so simple values, object values and expressions are very much interchangeable in Fusion. Let's combine two strings to generate the output Hello world! Eel comes with a selection of helpers that can be used for different purposes. The String, Array, Math and Configuration helpers include many useful functions to work with data in expressions. Rewarded for solving code examples about Fusion basic syntax. The earner knows how to use simple values, extend object declarations and use simple expressions to manipulate string or array values. 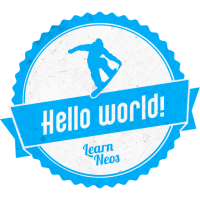 You earned the Neos Fusion Hello world! badge! You can store this badge in a Mozilla Backpack account. It's part of the OpenBadges project and used to collect badges from many different sites. We hope you enjoyed our interactive tour through some of the TypoScript 2 features. The next In Action article will feature context values, working with nodes (your content) and shows you the magic of FlowQuery.